Summertime is a great time to visit Niagara-on-the-Lake for so many reasons. Whirlpool Jet Boat Tours has partnered with premier attractions on new travel packages that aren’t for the fain of heart. The Wet and Wild Adventure allows thrill seekers to get their adrenalin pumping on three of Niagara’s top adventure attractions. 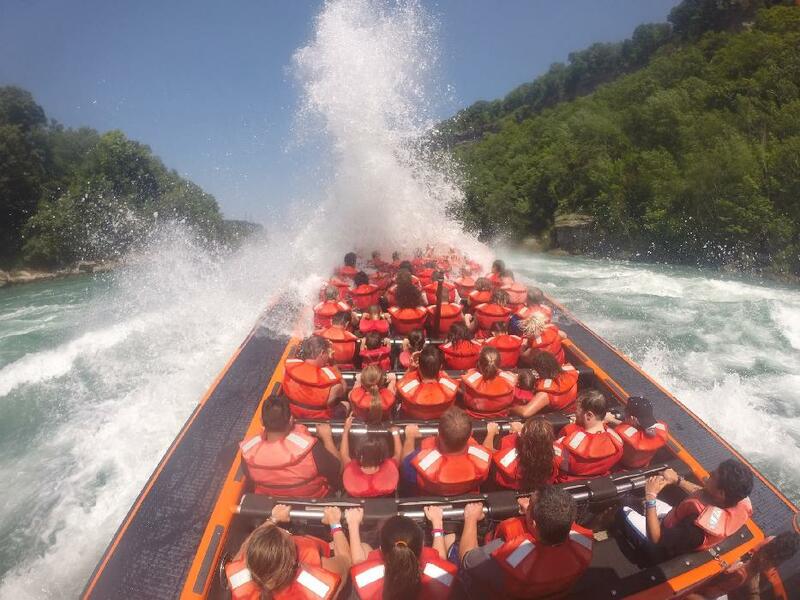 The package includes an hour-long joy ride with Whirlpool Jet Boat Tours from the mouth of the Niagara River through the Class 5 Devil’s Hole Rapids and to just below the incredibly powerful Niagara Whirlpool. From there, adventurers get a bird’s-eye view of the incredible scenery. The package includes a breathtaking zipline ride to the base of Niagara Falls with Wildplay MistRider Zipline and a spectacular obstacle course suspended over the Niagara Gorge with Wildplay Whirlpool Adventure Course. Adrenalin junkies love the thrills on board a Whirlpool Jetboat tour. Passengers can choose between two types of trips—wet or dry. Guests in open-topped jet boats are guaranteed to return to the dock soaking wet, doused with gallons of water while their boat pilot powers them through the rapids at high speed and expertly spins them through the chop in a complete 360-degree turn. Passengers in the covered Jet Dome get the same thrill ride, minus the splash, and return as dry as they were at the outset. 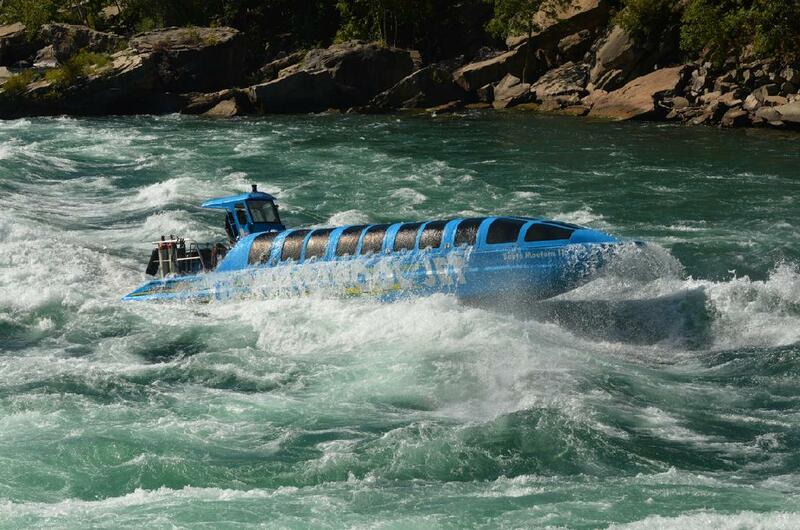 If you prefer to stay dry during your adrenalin rush, book a seat on board the domed Whirlpool Jetboat. Trius Red presents Blues at the Winery, August 12, 2017, 5–9:30 p.m.
Gates open at 4 p.m. for Niagara’s original BLUES festival featuring JW Jones, Andria Simone and Al Lerman. Join up for an evening of delicious wine, delectable food and the finest blues music on the winery’s backyard stage. Tickets start at $40 CDN and can be purchased online. Peller Estates Wine Country Fare, August 26, 2017, 6–10:30 p.m. Grab your Stetson, dust off your cowboy boots and head on down to the Party in the Vineyard at this summer’s hottest country music festival. Kick off the evening with entertainment provided by the boot-stomping sounds of Canadian country artists Buck Twenty and Runaway Angel, then get ready to party with country favourites, Emerson Drive. Tickets are $49 CDN and can be bought online. What do goats and yoga have in common? Probably nothing, unless you join a yoga class at Fox Den Studio located on Concession 6 in Niagara-on-the-Lake where very playful pygmy goats interact with participants and keep everyone entertained and giggling as they go through your traditional movements and meditations. The craze continues to grow and has even become a tourist attraction here in Niagara-on-the-Lake, adding one more reason to visit to an already long roster of attractions, activities and events. Soon, Melinda Morsch, owner of Fox Den Yoga, will be offering classes for corporate team-building workshops, fundraisers and private parties. What a great addition to a bachelorette weekend getaway! Isn’t time you traded in your stress and inhibitions for a fun, uplifting afternoon or evening? For information or to book a class, visit them online or call 905-468-9042.